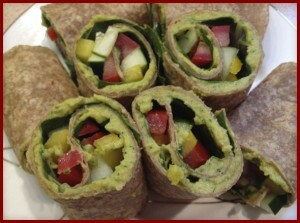 This recipe was inspired by Recipe Redux’s July Challenge: a no bake healthy meal. I got to thinking about how much I love avocados and how much I don’t love hummus. 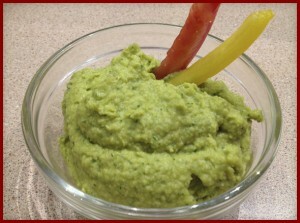 But a twist on hummus with avocado…that sounded like a good idea to me. Plus, by combining the two, we’ll get the fiber of the avocado, while tempering its good fat with high fiber chic peas. Both are great protein sources, packed with vitamins and minerals, so we’ll have a super healthy meal component! extra veggie strips for dipping! Rinse and drain chic peas. Put into food processor. Slice avocado in half. Spoon insides of avocado into food processor. Add rest of ingredients into food processor. Blend together until smooth. You will need to stop 1-2 times and scrape down the sides and blend again to incorporate all ingredients and hummus is smooth. Set aside. Lay your tortilla out flat. Spread 3-4 TBS of Avocado Hummus on your tortilla depending on the size. Don't go all the way to the edges so that when you roll it it doesn't all squeeze out. 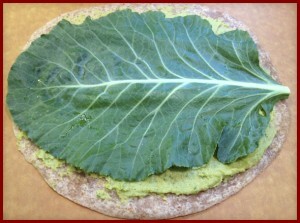 Lay your collard green leaf on top the Avocado Hummus. Trim your leaf if it doesn't quite fit. Lay your veggie strips in neat horizontal rows. Use 2 of each veggie, lined up vertically. I used tomato, yellow pepper, then cucumber. Roll your wrap halfway. Lay down another row of veggies, 2 more of each in a vertical row. Roll your wrap up all the way. Cut into small bite size pieces. Eat right away or pack up and enjoy on the go! 1. Cut your veggies in equal sized strips. 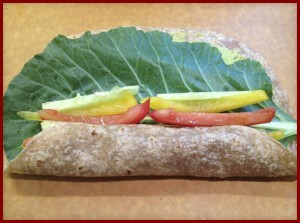 For the tomatoes, I prefer to remove the wet insides (the seeds and pulp) for a neater and easier to eat wrap. 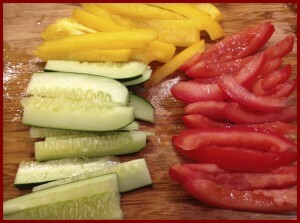 In the pic below, the red slices are tomato, not pepper! 2. Lay your tortilla out flat. (look for a tortilla like Ezekiel Sprouted brand) 2. 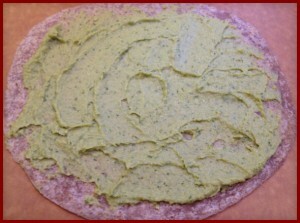 Spread 3-4 TBS of Avocado Hummus on your tortilla depending on the size. Don’t go all the way to the edges so that when you roll it it doesn’t all squeeze out. 3. 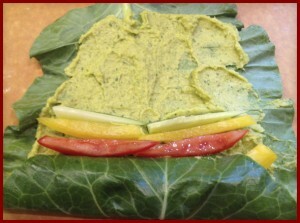 Lay your collard green leaf on top the Avocado Hummus. Trim your leaf if it doesn’t quite fit. 4. Lay your veggie strips in neat horizontal rows. Use 2 of each veggie, lined up vertically. I used tomato, yellow pepper, then cucumber. Avocado always makes things taste better. This looks like a wonderful Summer meal. Thanks! I couldn’t agree more about avocado. One of my favorites. Thanks for checking it out! Well, I love humus and avocado so think I’m really going to love this. What a great way to incorporate collard greens. 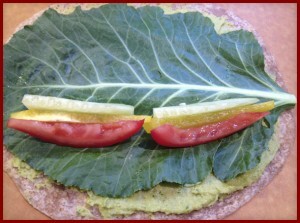 I’m always looking for a yummy, creative ways to get in those super healthy leafy greens. I love them, but like everything, I need new ways to eat them!